The main difference between LCD and LED displays is that the LED displays consumes less power and is best for picture quality when compared with the LCD displays. Liquid crystal display is what LCD stands for and LED stands for Light-emitting diode. But, from a technical point of view, both LCD and LED are liquid crystal displays. The technology used in both television types are the same. They use two layers of polarized glass through which the liquid crystal will pass and block light. Therefore, LED can be said to be a subset of LCD. LCD refers to liquid crystal display and is the technology used in small computers and notebook. LCDs are much thinner when compared to CRT or cathode ray tube technologies. LCDs consume less energy as they work with the principle of blocking light. LCDs are made up of several layers. The layers will include polarized panels where the liquid crystal solution sits in-between them. The light will be projected through the liquid crystals and are colorized to produce images. LED stands for Light-emitting diode. It generally refers to an LCD TV that uses light-emitting diodes to backlight the display. It does not use cold cathode fluorescent lights as with LCD televisions. LED TVs are usually called LED-backlit LCD television. A LED is a semiconductor device which is capable of emitting light when an electric current pass through it. LED has low power requirements and is efficient at converting power into light. Furthermore, heat loss is less and the light focus is more which results in less fuzziness. LEDs are capable of lasting longer when compared with other lighting technologies. 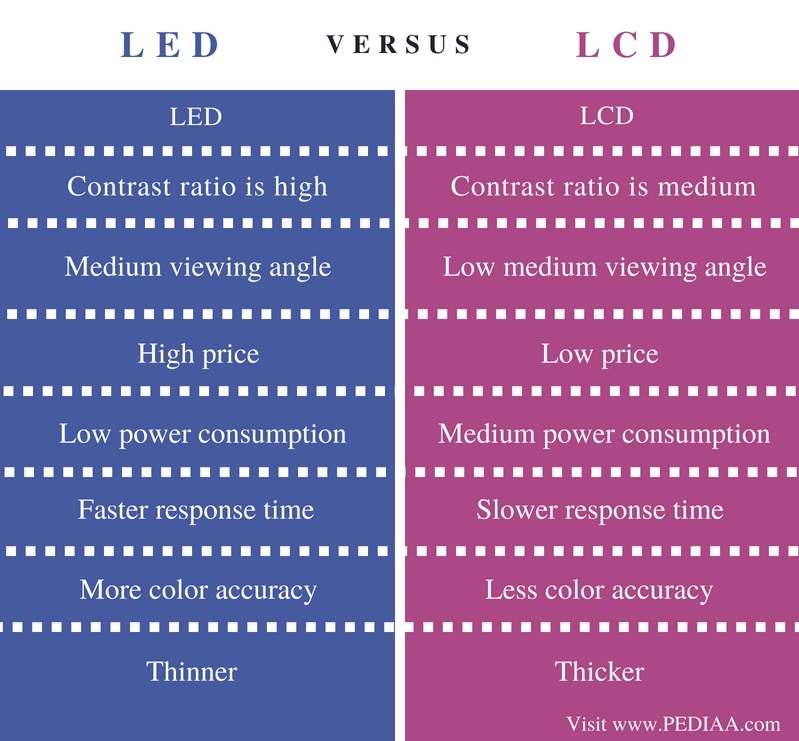 Here, we will discuss the main difference between LCD and LED, specifically in reference to TVs, based on the technology, picture quality, and viewing. LCDs use fluorescent lights while LED TVs us light emitting diodes. The light placement of LED TVs can also be different. The LCDs always have their fluorescent lights behind the screen. On LED TVs the light emitting diodes can exist behind the screen on the edges of the screen. The lighting and the placement of the lights have made it possible for LEDs to be thinner when compared with LED TVs. It also means that LED TV is capable of running with better energy efficiency and is able to produce clear and better pictures when compared to LCDs. LED is capable of producing better picture quality due to two reasons. LED TVs operate with a color wheel or using RGB (Red, Green, Blue) color lights. This will enable color lights to produce more harper and realistic colors. The second reason is that Light emitting diodes can also be dimmed. The ability to dim the backlight of the LED TV allows the picture to display black color that is true by blocking the light and darkening the lights from passing past the panel. This capability does not come with the edge-lit LED panels. Edge-lit LEDs are capable of producing truer whites when compared with the Fluorescent LED TVs. As today’s LCDs are thin they will come with issues like angle viewing and anti-glare problems. Backlit TVs provide better angle viewing when compared to edge-lit LEDs. When compared with a standard LCD TV, backlit LED TVs produce better angle viewing. LEDS and LCD are reputed for gaming and playback quality. Before you get ready to buy an LCD or an LED TV you should consider the price factor. LED-backlit TVs are awesome but are more expensive compared to fluorescent-lit TVs. If you are looking for picture quality, and can a spend a bit more money buying an array LED backlit panel will make sense. If you are looking for a very thin TV, edge-lit LED will be the best choice. 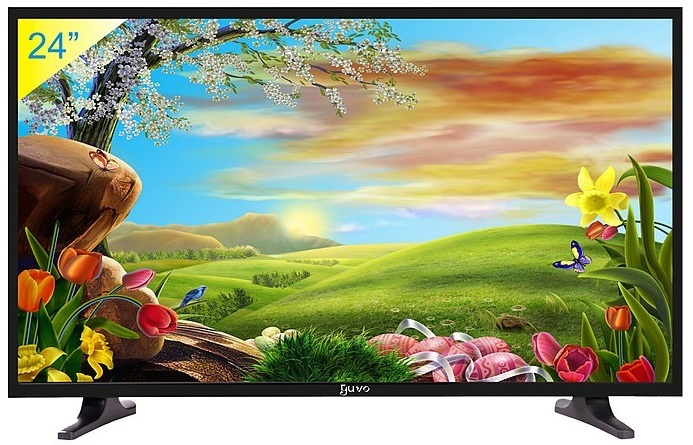 If you are looking for a budget TV a fluorescent-lit LCD will be the ideal choice for you. oriented person who is in the lookout for new trends and developments in technology.